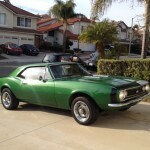 And the War begins…not a military war but the Mustang-Camero war. 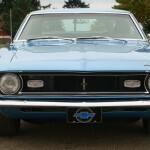 Or maybe it is the Mustang-Camero battles of the Ford-Chevrolet War? 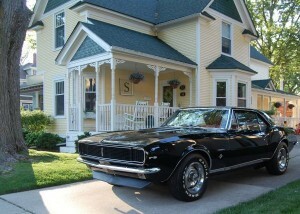 But the year was 1967 and Chevrolet took direct aim at the Ford Mustang and unleashed the Chevrolet Camero. 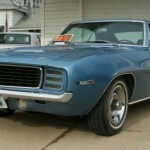 The Camero and its corporate cousin, the Pontiac Firebird, were part of a project by General Motors and Chevrolet to eradicate the Mustang (Ford code name Panther). 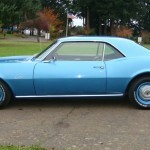 As part of Chevrolet’s marketing ploy, Chevrolet held meetings for a ficticious organization called Society for the Elimination of Panthers from the Automotive World to introduce the Camero. 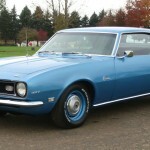 Introduced in September 1966, the Camero was built on the all new rear-wheel drive GM F-body platform, which would only be shared with the Pontiac Firebird. 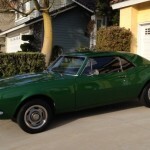 The Camero had 2+2 seating and was available as a 2-door coupé or convertible. 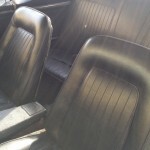 It was offered in base, RS, SS and Z/28 trim levels. The RS was an appearance package which included hidden headlights, diffrent taillights with back-up lights under the rear bumper, RS badging, and exterior rocker trim. 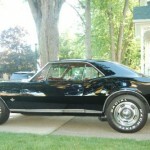 The SS package included the 350 cubic inch V8 engine standard with the 396 cubic inch big-block V8′s optional. 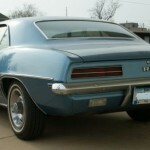 The SS had non-functional air inlets on the hood, special striping, and SS badging on the grille, front fenders, gas cap, and horn button. 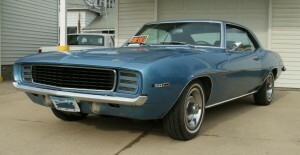 It was possible to order both the SS and RS to receive a Camaro RS/SS. 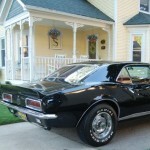 The Z/28 option was introduced in midway through the 1967 model year. 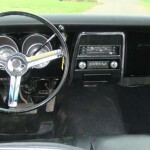 The Z/28 offered a “virtually race-ready” Camaro straight from the salesroom floor. 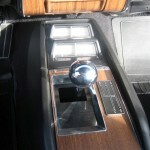 The Z/28 package required power front disc brakes and a Muncie 4-speed manual transmission. 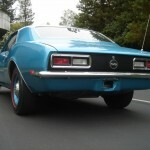 It featured the 302 cubic inch small-block V-8 engine, an upgraded suspension, racing stripes on the hood and trunk lid, and “302″ front fender emblems As with the RS/SS, it was possible to combine the Z/28 package with the RS package. 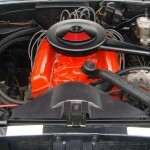 The engine options included a a choice of 250 cubic inch inline-6, a 302 cubic inch V8, a 307 cubic inch V8, a 327 cubic inch V8, a 350 cubic inch V8, or a 396 cubic inch V8. 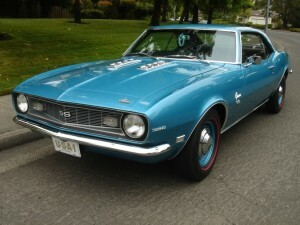 To separate the Camero from the Corviar, the Camaro was advertised as having the a conventional rear-drive front-engine configuration. 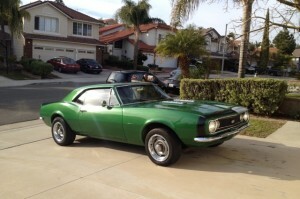 Chevrolet made minimal changes to the Camero in 1968. A “Astro Ventilation” sytem was introduced. 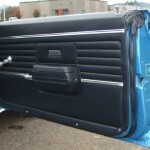 The system was a fresh-air-inlet system and eliminated the need for the side vent windows, which were deleted. 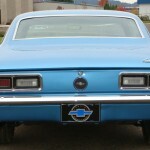 Side marker lights were added on the front and rear fenders in compliance with a government mandate for all 1968 cars. The grille and taillights were revised. The front running lights on non-RS models were changed from circular to oval. 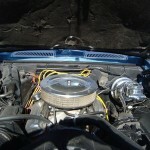 And the big block SS models received chrome hood inserts. Mechanically, the shock absorber mounting was staggered to resolve wheel hop issues. 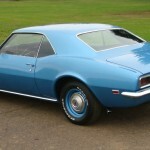 Higher performance model Cameros received multi-leaf rear springs instead of single-leaf units. 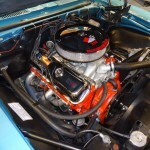 A 396 cubic inch big block engine was added to the option list for the SS. 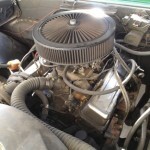 The 427 cubic inch engine was no longer available on the base model although several dealers offered the 427 as a dealer-installed option. 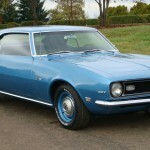 Even though 1969 would be the final year for the first generation Camero, the Camero would receive new body panels, except the hood and trunk lid. 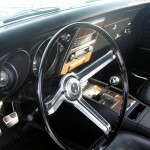 However, the drivetrain and major mechanical components would carry over from 1968. The grille was also redesigned with a “V” cant and deeply inset headlights. 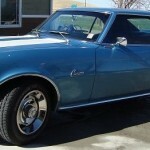 Four wheel disc brakes with four-piston calipers were made available during the model year. The RS option now included black painted grille with concealed headlights; headlight washers; fender striping; simulated rear fender louvers; front and rear wheel opening moldings; black body sill; RS emblems on grille, steering wheel and rear panel; Rally Sport front fender nameplates; bright accented taillights and back-up lights below rear bumper. 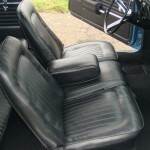 The 1969 model year was extending into November 1969, due to manufacturing problems with the second generation model planned for 1970. 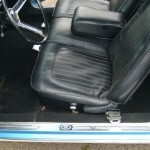 For other popular Chevrolet models of this era, see our post on the 1966-1967 Chevrolet Chevelle or the 1965-1970 Chevrolet Impala. 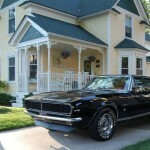 To find your own pony car or to sell your classic car, see the listings in Classics for Sale. 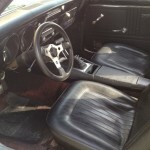 This entry was posted in Camaro, Chevrolet and tagged Chevy II, corvair, F-Body, Firebird, mustang, Pony Car. Bookmark the permalink.